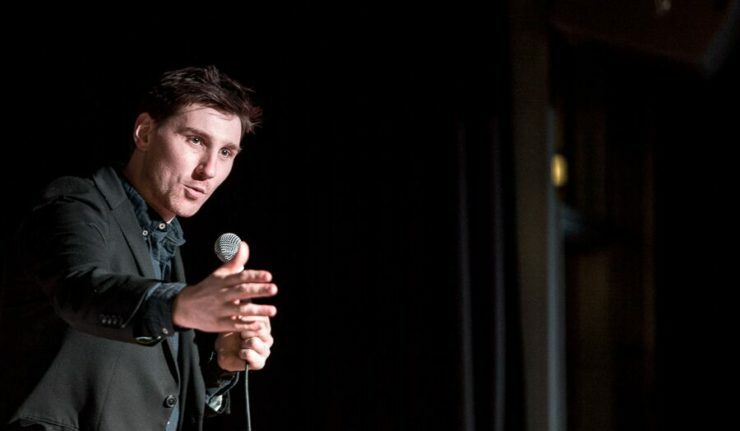 Following a whirlwind year of high-profile tour support slots with Ricky Gervais, Bill Burr and Doug Stanhope, a 2018 Chortle Award nomination and a sell out Edinburgh Fringe run, Sean McLoughlin – ‘The best comedian you haven’t heard of yet.’ (Time Out) – is bringing his new tour to Leicester, at The Cookie on Thursday 4 April. Have you watched Ricky Gervais’ After Life yet? You might have spotted him in that too! Now aged 30, all Sean really wants is to walk into the sunset with the love of his life and his head held high, but before that there’s some demons he needs to sort out. We caught up with him to find out more about the show! What can people expect for those who’ve never seen your comedy before? 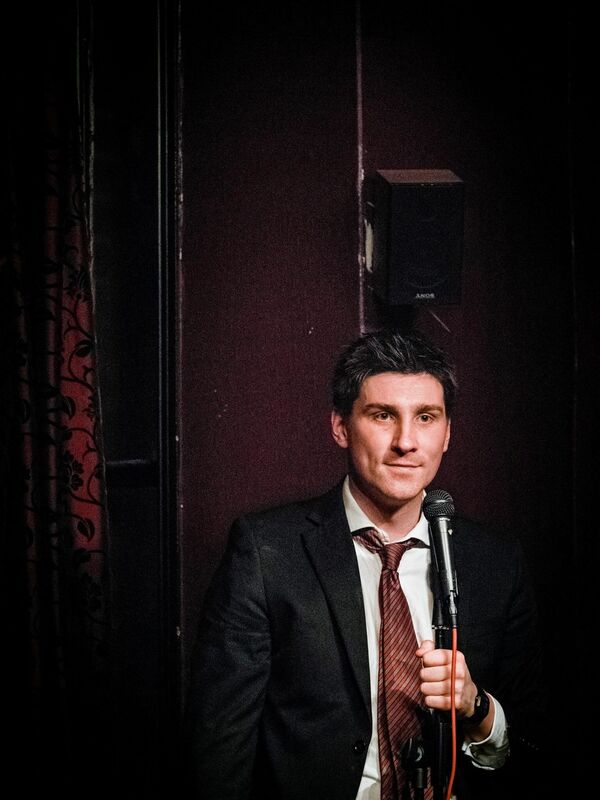 A night of pure stand-up from a grumpy lanky man. I just stand onstage and tell jokes and stories about my life really. The show I’m bringing to Leicester is called ‘Hail Mary’ and it’s mainly about turning 30, technology, love and God, so if you’ve heard of any of these ideas you should get something out of it. You’ve supported some really big names including Ricky Gervais, Katherine Ryan and Doug Stanhope, how does a support gig differ for you from headlining your own show? Support slots are generally very fun and exciting though there are times the crowd didn’t know there would be an opener and the disappointment can be audible. Doing your own show is different because people have come out just to see you so there’s a bit more wiggle room in what you can say to the audience, but with both you still ultimately have to be good to keep everyone’s attention. Speaking of Ricky Gervais, After Life has received rave reviews and you actually have a small part in the series. How was that to be part of? It was a lovely surprise. Ricky called me and mentioned a small role he thought I could play in the show which was nice. He then told me I was playing a crap comedian which was less nice but still great work to get. The day I filmed it was pretty fun: I got my own trailer, I was fed great food and they picked me up from my house in a Mercedes. Actors have a much better life than comedians, I tell you. What’s your favourite gig you’ve ever done? If I had to pick one it would probably be when I supported Gervais in Copenhagen in September 2017, three days before my thirtieth birthday. The venue was the recently-opened Royal Arena and the audience numbered 15,000 which was huge even by the standards of that tour. In all my years I’ve never played to such an electric crowd and I later found out that this was the first comedy show that took place in the venue, making me technically the first comic to ever play that arena. Pretty cool. Time out described you as “The best comedian you haven’t heard of”, but surely that’ll be changing soon, right? Hard to say. 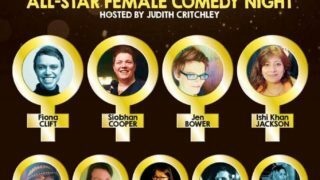 I think there’s a heck of a lot of talent in UK comedy at the moment and it feels like the entertainment industry shifts so quickly it’s hard to know what will happen. All I do is try and make the work I produce be as good as possible. That’s all anyone can do, right? You’re playing at The Cookie on Thursday 4 April – tell our readers in 10 words why they should come. Nice venue. Nice comedian. Jokes happening. Moon landing was faked. Tickets for Sean’s show at The Cookie on Thursday 4 April are priced at £10 and are available from SeeTickets.